*The day began with an early morning conversation with April M Lee in Italy. Well, early for me, around dinnertime for her. It was wonderful visiting about our week, and how things were going. She wondered how my presentation on Italy went, and it was fun sharing with her all the details. *Paul continued working on his project out in the yard, and got it completed by the time I was done talking with April on the phone. We now officially have a larger backyard area. *Since it was the last day of the month, we only had today to get our third “Twelve Dates of Christmas” accomplished. We drove to Coeur d’Alene. Our first mission was to pick up some medicine for Christy’s cat Junebug in Hayden. After a little detour, and Christy getting us back on track to finding the correct pharmacy, that errand was completed. *Movie time was on our agenda next. We drove to Riverstone Cinemas and watched the movie I Can Only Imagine, the story of Bart Millard, of the band Mercy Me. Bart wrote the song I Can Only Imagine. The movie tells the story of how he grew up with an abusive father, and how circumstances in his life brought him to the point where he wrote this very well-known and popular song. It was a very touching story. *My two pairs of jeans were worn out, so I needed a couple of new pairs. We drove to the Silver Lake Mall, and went to Penneys. I found two pairs of jeans, Paul found two pairs of pants, and we got them all on a really good deal. (We saved $106 buy four pairs of pants..LOL!!) Then we walked over to the new big shoe store in the mall and I was hoping to find some sandals, but there wasn’t anything I liked. But Paul did find some shoes. So all in all, it was a very successful shopping trip. 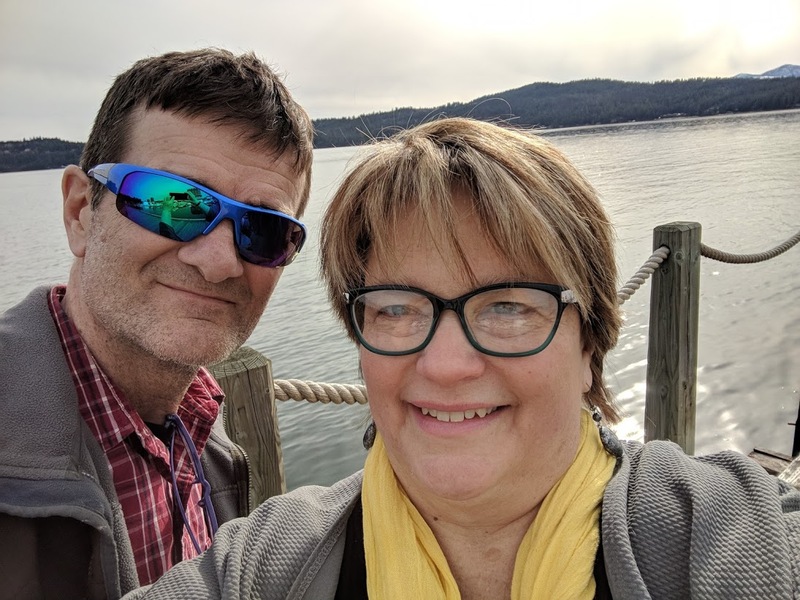 *It was a beautiful day in Coeur d’Alene, so we decided to take advantage of the nice weather and go down to Coeur d’Alene Lake and walk around for a while. We parked by the Coeur d’Alene Resort, and walked around the boardwalk that surrounds the resort and the marina. It was pretty quiet down on the water, and very peaceful. *Our final “date” destination was Red Lobster for dinner. Paul’s parents had given us a gift card for Christmas, and we were finally able to use it. The meal was perfect. We both ordered fresh Maine lobster, where they take it out of the tank, steam it, clean it, then bring it to your table. Our server cracked it for us, and then we dug in. We also had a Caprese salad, and I had broccoli and asparagus, and Paul had green beans and asparagus. It was a really good meal. Well worth it!! *When we arrived home, I decided to watch another episode of Midsomer Murders and do some knitting. It was a nice relaxing end to a wonderful day spend together.